2017 was a tough year for everybody trying to navigate the Canadian market. With many changes, downfalls and climbs, even many new realtors struggled and searched for good advice on the internet. 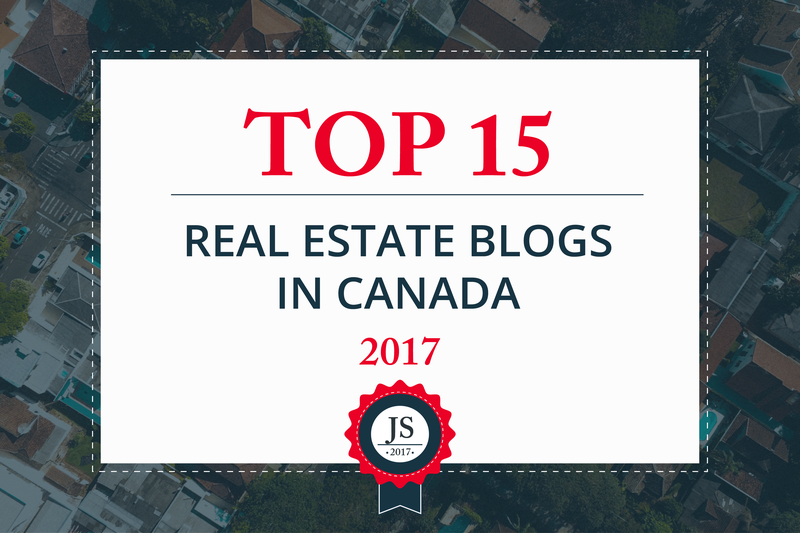 That's where Canadian Real Estate Blogs played a big role in reporting the changes on the market, explaining in great detail many topics that buyers and sellers alike had to understand before entering the market. Zoocasa made it to our #1 place this year yet again after a brief fall last year, when Better Dwelling stole their crown for a moment. 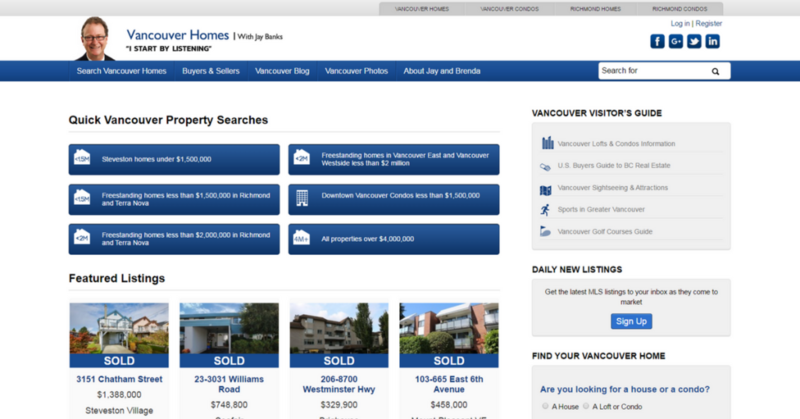 But the Queen is back on the top with impeccable content, essential to every new buyer and seller on the market. One of the site features, which many buyers and even many realtors appreciate is their thorough infographics section mapping the market. If you are still not convinced, Zoocasa deserves the first place on this list, download their app, that's available both for iOS and Android and take a look yourself. Buzz Buzz Home is a blog that made it to the list only last year and continues to amaze and educate its readers about real estate, home decor and everything else that can play a role in living in your dream home. Their fully responsive site is very accessible and easy to navigate, with tons of great content and even better writing. Among the stunning home decor articles, thorough market reports and tech news, you can find gems like bad home listings photos and celebrity mansions spotlight. 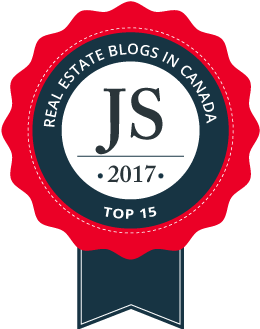 "Fastest growing Real Estate blog" Better Dwelling is a clean site that goes straight to the point—their content. 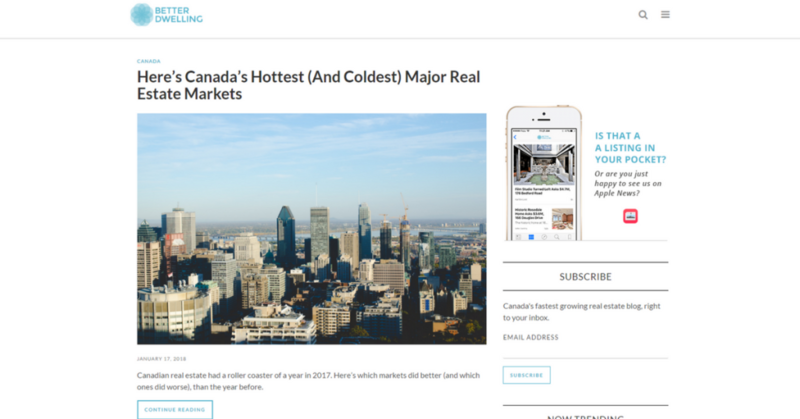 You can find an assortment of real estate news reporting on Canadian market with the main focus on Toronto and Vancouver. But that doesn't mean other parts of the world go unnoticed, as Better Dwelling has a section about US market, Chinese market an even global market. If there's a question you would like to ask, they have a large Forum on their site that will answer all your real estate questions. Our favourite Torontoism got a makeover this year, with a new autoplay video introducing their team to every newcomer on the site. With this new feature prominent on the home page, you have to scroll a bit down to get to the main content. 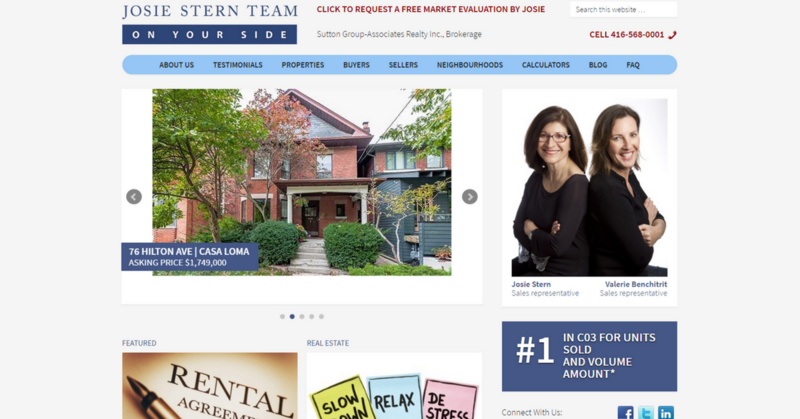 Featuring real estate and lifestyle articles, as well as team videos and neighbourhood guides, ex-TREB president Richard Silver and his Torontoism team are preparing really valuable content for every client looking to buy in Toronto. 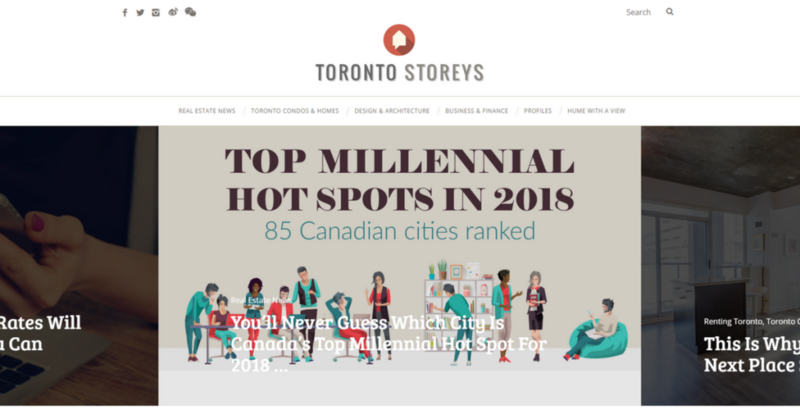 Toronto Storeys, running under a PSR branding, is a new player that joined real estate blog waters in 2016 but became quite popular over the course of last year. Featuring real estate news and market reports, Realtor spotlights and lifestyle article, Toronto Storeys is very versatile when it comes to themes for their posts. Responsive and clean design is another reason why the modern reader will be very pleased with the overall experience of visiting their site. 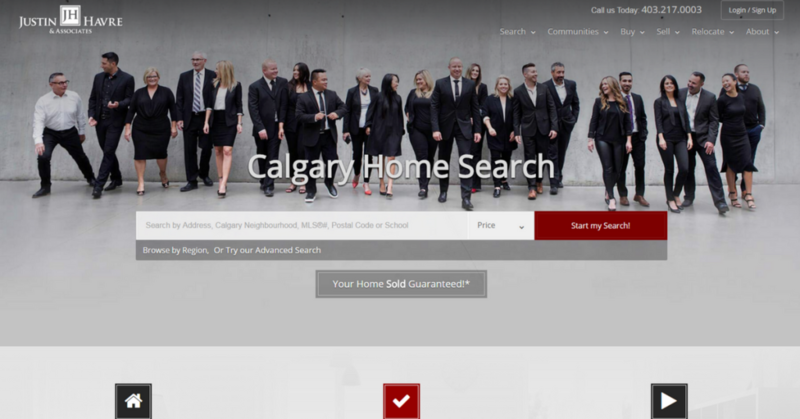 If you are even thinking about getting into real estate in a Canadian market, their site is a must-see. 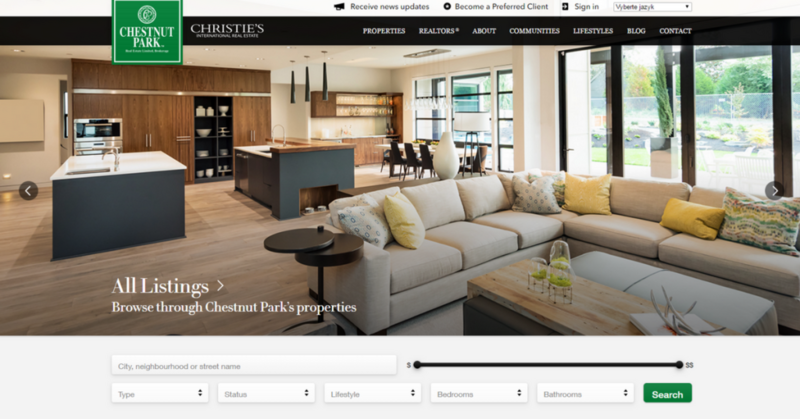 Point 2 Homes site doesn't have the most beautiful design to be honest, but their valuable content makes up for it. Finding a link to their blog on the main page is a bit of a challenge (hint, it's in their Follow Us section in the footer), but if you do manage to find it, a very clean and responsive site will be waiting for you. They update the blog frequently, with articles for realtors, home buyers and even investors. 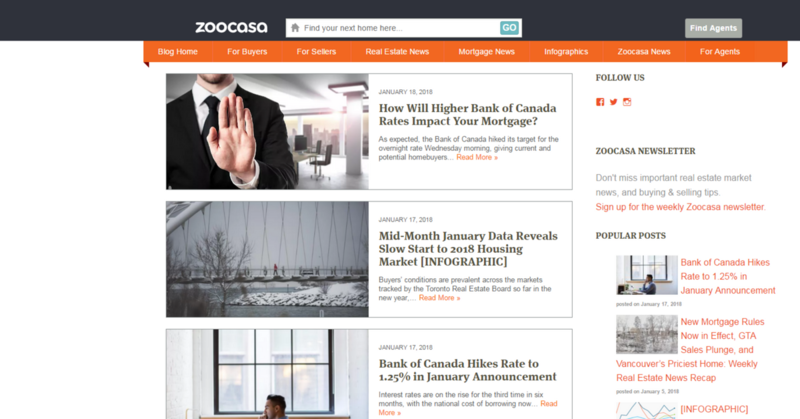 If you want reliable news from all around Canada and USA, this is the right blog for you. Julie Kinnear's site is a large resource for everything she and her team are passionate about. 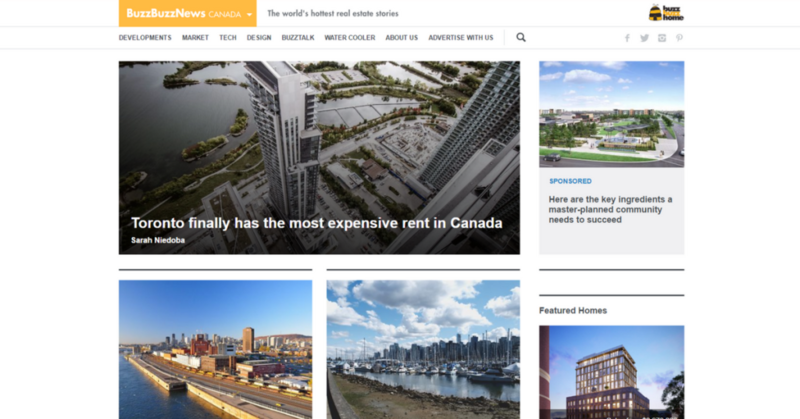 From Toronto Farmer's Markets, neighbourhood photo essays, market news and reports, to very entertaining ongoing series called Real Estate lessons in movies, where every movie teaches you a valuable lesson, there's something for anyone. No wonder their homepage looks a bit cluttered and it takes a minute to get oriented in the mass of information suddenly coming from the screen. But if you are looking for a good real estate blog that doesn't take itself so seriously, look no further. Julie and her charming personality comes through in every article. 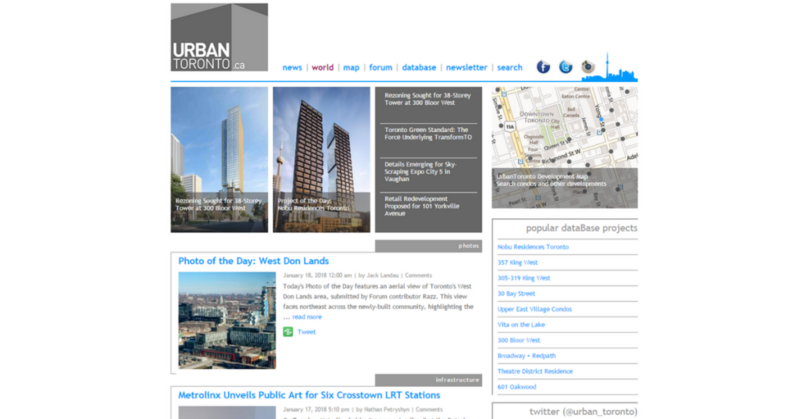 Urban Toronto is a community hub in the form of a website, focusing mainly on Toronto condominium segment. The amount of content produced every day is outstanding, considering the site is updated every day bringing information on new developments through the city. And since 2017 was the year of the condo, this site was surely a valuable resource to many your Torontonians looking for a new home. 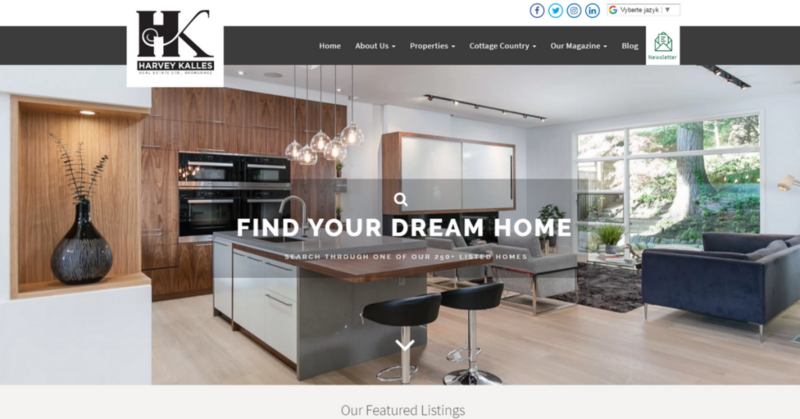 Justin Havre & associates have a knick for good real estate themes. Featuring everything you ought to know from Calgary market news to fixing roof damage on your property, they will write about it and serve it to their audience on a clean site with perfect responsivity. The only downside is, that blog link is again hard to find, hidden inside a drop-down menu and some site features load very slowly. 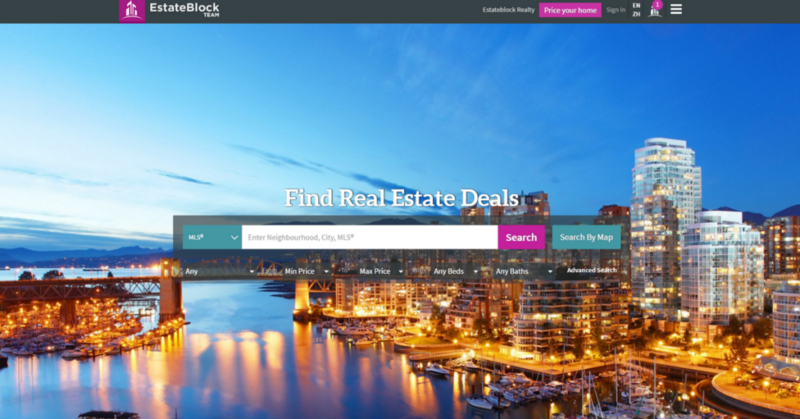 Estate Block is writing strictly about Vancouver market and its ups and down, focusing on real estate facts rather than speculations and shenanigans. The design looks a little outdated and the hidden desktop menu has a strange feeling to it, but overall, the site is clean and very straightforward, guiding the reader exactly where he wants to navigate. The detail-oriented content with tons of valuable infographics will be a resource for many clients and realtors alike. Chestnut Park is one of the blogs that were a real surprise this year. Their modern design update gave them a chance to appeal to the reader looking to know more about their GTA based business as well as the blog. 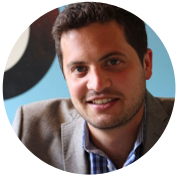 They feature very market focused articles with occasional lifestyle tip thrown into the mix. The mobile version of their website could more responsive and updated, but the desktop version meets all the criteria to be aesthetically pleasing as well as functional. Josie Stern has an assortment of expert articles about everything real estate. Her blog is a very good accompanying piece to her website, helping clients looking for a little more expertise. She usually explains every topic in great detail, easy for even inexperienced sellers and buyers to understand the problematic. And what she doesn't feature in the article, she can answer in the comments. 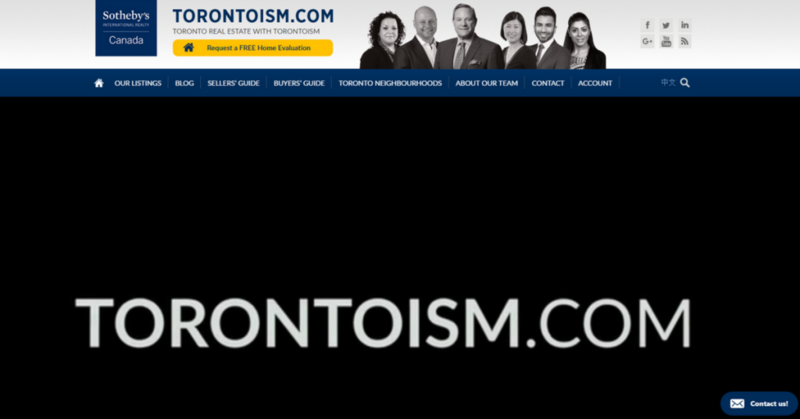 If you don't know about Toronto Realty Blog, you probably haven't lived in Toronto that long. This huge resource blog with a very outdated theme is documenting Toronto real estate scene for 10 years now through the eyes of David Fleming. 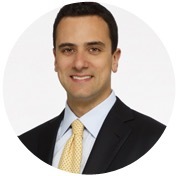 It updates every couple of days with very insightful and personal view on today's market, explaining things that nobody bothered to explain before and reporting on what are often very controversial themes. Vancouver realtor Jay Banks focuses on photography, besides reporting on the musings of Vancouver market. This site is regularly updated with stunning photo essays and his newest series Vancouver Film Locations helps to introduce Vancouver's historic buildings that played the starring role in many movies and tv programmes. Make sure to visit Jay's social media as well, where he brings much more amazing photography content and shares stunning pictures of Vancouver every day. Last years number #2 dropped to #15 this year. Despite great content, with slightly updated design came bugs and slow loading time. We didn't love the way blog posts are displayed either, with too long introductions and pictures, that are not prominent enough to caught readers attention. However, there are still many features that make Harve Kalles' site attractive. For example the site's full responsivity, a complimentary printed magazine for clients and even a great listings page filter. Social media accounts are also updated regularly, so make sure you follow Harvey on both Facebook and Twitter. Hard to miss with his unusual illustrations, author and blogger Garth Turner has been reporting nuances of the real estate market since 2008. And that is exactly how long this blog existed without a change in design. Old, non-responsive theme makes this blog so hard to read, even if the content is great, if not too controversial. 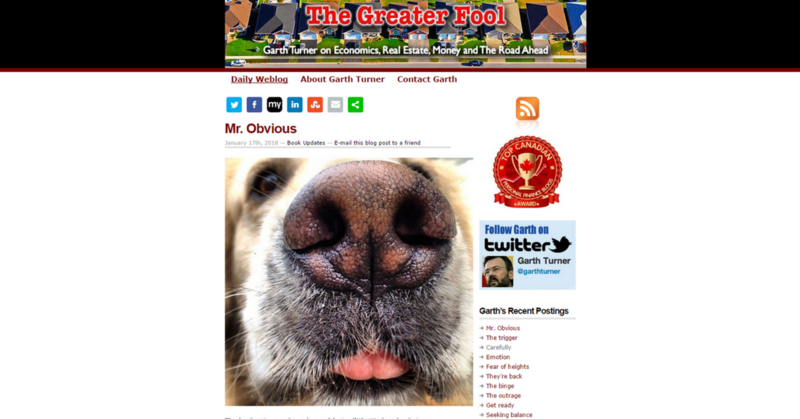 His real estate blog helped Garth get into politics, start numerous Twitter wars and get into trouble for his personal stories that accompany most blog posts. But as every great author, he puts a big part of himself into his writing. It certainly shows on his popularity on social media, where he has over 11 thousand followers. 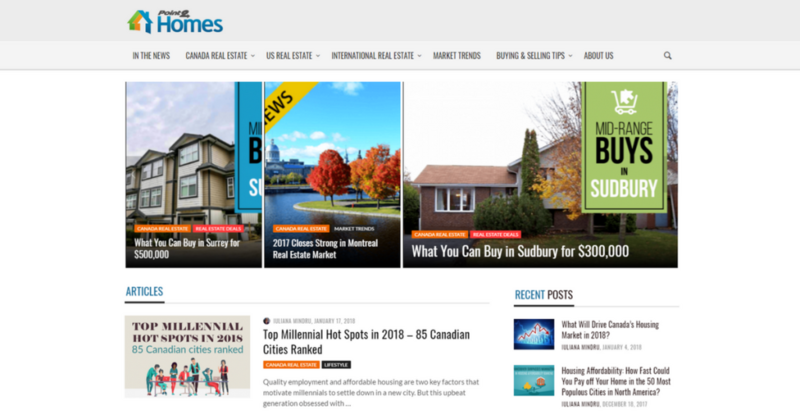 Bringing great responsive design and clean menu back to Ottawa real estate, what Team Realty blog misses is visibility and more thorough articles. The articles, nicely written, are all very short trying to get straight to the point as quickly as possible, which can sometimes be more harmful than helpful. More thorough explanations on some of the themes could help readers of this blog better understand the issue and connect with the author more. Other than that, the site is very functional and they don't shy from having some fun on their social media. 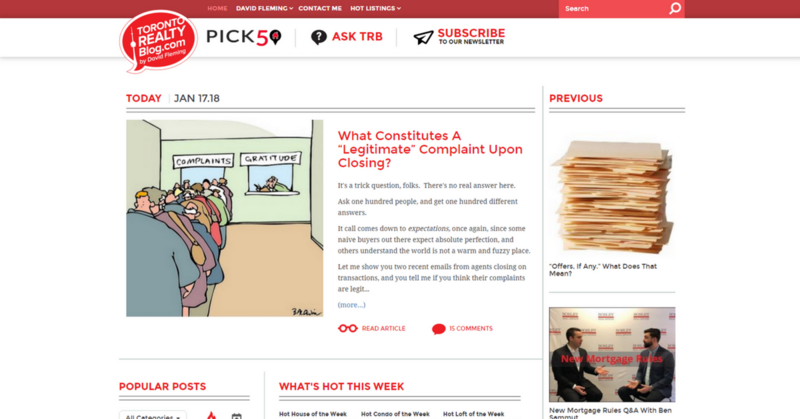 Conflict of interest is the bugbear of Real Estate blogs. With the exception of Betterdwelling and Greaterfool, this list is mostly made up of cheerleaders who cherry-pick stats and ‘go along to get along’. Take the recent trumpeting that Toronto house prices are up YoY. No mention of the record-setting monthly declines that began in the Spring. No mention that prices are down 20% from the peak or that most sales took place amid that froth. Or that these very same blogs stoked FOMO with the “get in while you still can” refrain. But they serve real estate interests, so there’s pressure to pump the pom-poms. please feel free to submit your picks that should be on the list here in the comments. I will consider them. One of the best blog posts I’ve read! Thanks for sharing this! Great list. I would definitely include Mary Dempsters’ Toronto Real Estate blog at https://marydempster.ca/blog. Check it out! Thanks for sharing your blog it’s very informative. I wanted to add this incase you do a 2018/2019 edition and we run https://luxuryresidence.ca which covers all things high end here in Canada. Thanks for sharing these top blogs, really useful to find advice on here.